Rajkumar Hirani's Sanju which has been on a dream run at the box office has now surpassed the lifetime collection of Bajrangi Bhaijaan emerging to be the fourth highest grosser of all time. Going strong in its third week, Sanju has been breaking major records at the box office. After creating a record with the phenomenal numbers on an opening day, Sanju has been raking high at the box office winning hearts all over. The Rajkumar Hirani directorial has crossed over 323.39 crores in three weeks and is running strong at the box office. 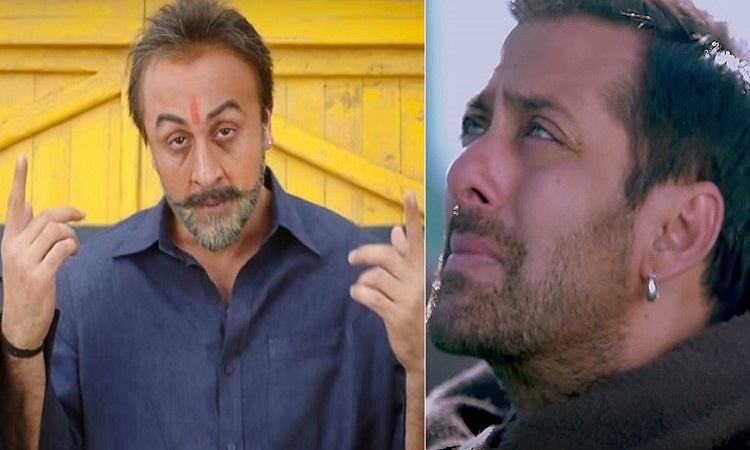 Racing ahead to break more records, Sanju now stands to be the fourth highest grossing Bollywood film after Dangal: 387.39 crores, PK: 339.5 crores and Tiger Zinda Hai: 339.16 crores. Sanju depicts the life of Sanjay Dutt right from his younger days to his conviction. While Sanjay Dutt's life, time and again made headlines, a lot of unbelievable aspects of the actor's life yet remain untold. Rajkumar Hirani's Sanju promises to bring to the forefront the unabashed details of the actor's life unfiltered highlighting aspects like drugs, women, relationship with parents and friends, and inner conflicts. Produced by Vinod Chopra Films and Rajkumar Hirani Films in association with Fox Star Studios. 'Sanju' is running successfully all over.